If you happen to be interested in music for young children, I can highly recommend a beaut CD titled “Tuimbe Pamoja” produced by an organization called Swahili4kids. The songs are lively and have that wonderful African rhythm that makes it hard not to get up and dance – even if you have two left legs like me! 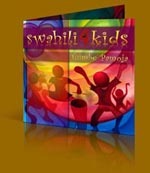 Children don’t need to know any Kiswahili at all to enjoy the music. The CD is not expensive (about $15 plus postage) and importantly 20% of the proceeds go towards helping young musicians in Tanzania. I’m sure your children will appreciate the music and I know that some children in Tanzania will definitely appreciate it too. Amani and Malaika love listening to it!